L-Għaqda Mużikali Imperial se tkun qed tagħti l-aħħar tislima lis-Sur Ġużepp Bartolo, Ex-President u President Onorarju tal-Għaqda, nhar is-Sibt 14 ta’ Lulju 2018 b’korteo funebri bis-sehem tal-Banda Imperial li jibda fis-1.45pm, u wara ssegwi Quddiesa Praesente Cadavere fil-Knisja Arċipretali Marija Bambina tal-Mellieħa. The Imperial Band Club will be bidding a final farewell to Mr Joseph Bartolo, Ex-President and Honorary President of the Club, on Saturday 14th July 2018. 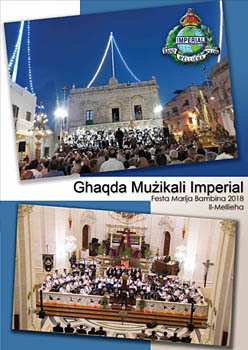 The Imperial Band will accompany the funeral cortege starting at 1.45pm, which will then be followed by a funeral mass in the Parish Church of Mellieha.